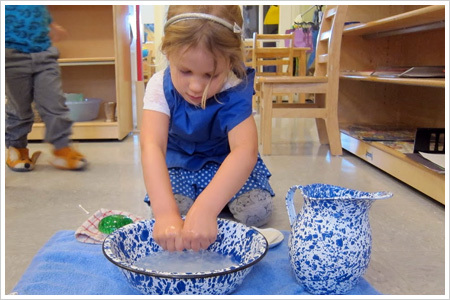 Our two Primary classrooms are led by certified Montessori teachers and offer a full set of traditional Montessori child care materials for students ages three-six. The classroom environment is peaceful, yet humming with the energy of children concentrating independently, helping out younger peers, receiving one-on-one lessons from a teacher, or working in small groups. Children are free to move around the room, choosing works from any area of the classroom that speaks to their interest and ability. In between lessons, children are encouraged to prepare a healthy morning snack when they are hungry, or take time for themselves in the library corner or at the Peace Table. In our Primary rooms you can find children who take true ownership over their learning and pride in their accomplishments. Respect for the child’s innate desire to grow and learn informs every decision we make in our six week Mindful Parenting course. Our thoughtfully prepared environment offers a safe place for your baby to explore, while the natural and open-ended pacing of this 90 minute class allows time for repetition and discovery. Parent Support and Discussion group will allow you to pair observations of your child with the facilitator’s knowledge of child development, so that you can bring Montessori into your home and support your child as they evolve towards self-reliance and independence. For students who are already enrolled in our CMS Academic Year, we offer Summer at CMS. Throughout the summer we enjoy plenty of outdoor fun at Cooper Park, and our Extended Day group loves spending the afternoons splashing around in the sprinklers! Summer is a time of transition for many of our students as some are just beginning their time at CMS and some have been attending for two or three years. During these summer weeks, we see returning students welcome their new friends into their classrooms, and new students thrive under the guidance of their new friends and teachers.